Sam’s K9 Academy and Puppy School Flintshire was establish in 2009 after Sam spent 2 years at collage and 3 years at university studying Animal Behaviour with a special interest in Canine Behaviour. Over the last 10 years the academy has grown to offer training for puppies, adult dogs and behavioural cases. In 2018 alone we had over 400 dogs come to us for help on their training journeys and in 2019 we were listed as one of the Three Best Rated trainers in Mold by an independent company. Sam began her professional training career by teaching Puppy School classes after being trained and assessed by well known behaviourist and author Gwen Bailey. This has now expanded into Sam teaching 13 classes a week for puppies and adults as well as working with difficult dogs on a 121 basis. In 2015 Sam was independently assessed by both the Institute of Modern Dog Trainers (IMDT) and the Association of Pet Dog Trainers (APDT) and achieved on both Full Membership. Sam is always working on obtaining more knowledge and learning new techniques and regularly attends CPD training in subjects including Canine Body Language, Aggression and Rehab, Specialist Scent Detection, Tracking, Rescue Puppy and Resource Guarding. Sam has worked with dogs from the age of 14 in numerous boarding kennels so has alot of practical handling experience with many different breeds. Sam grew up with a show cocker spaniel called Misty, at the age of 13 rescued a Shih Zhu cross called Rocky and started her training experience in local classes, at the age of 15 she rescued a 6 week old Lurcher called Molly and experienced many different dog sports and at the age of 18 she rescued a Saluki called Freddie who has been extremely mistreated. Freddie was very shut down when he arrived and would react extremely badly to people, Sam spent alot of time rehabilitating him to feel more comfortable and he is now a happy and content dog. Sam now lives with a Working Cocker Spaniel called Stanley, they enjoy trick training, shape training and agility training. She also has a Spanish rescue dog called Squishy who Sam worked with on a puppy rescue course and decided to bring her home. Stanley and Squishy work with Sam during one to one sessions to help nervous dogs. To see Sam's Qualifications please click here. In 2014 Sharon joined the team initially assisting in the Puppy Courses but now helps with the adult courses and in one to one sessions. 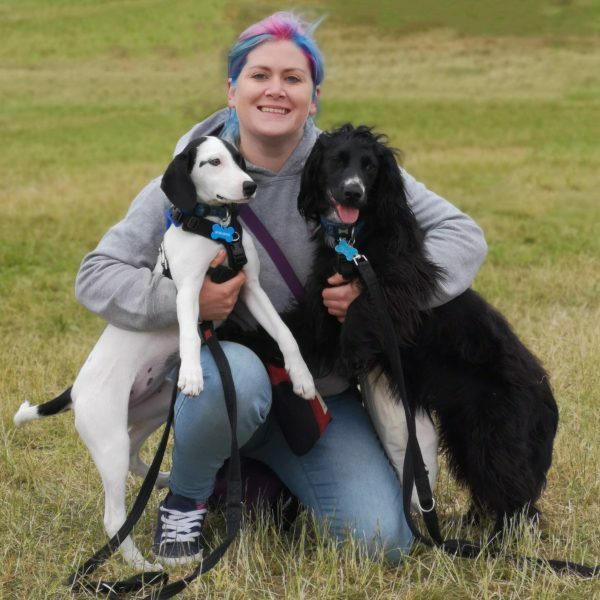 When Sharon first joined the group she was a first time dog owner but has had alot of practical handling experience and has joined Sam on many CPD courses. In 2016 Sharon was assessed by the Institute of Modern Dog Trainers and achieved Full Membership. 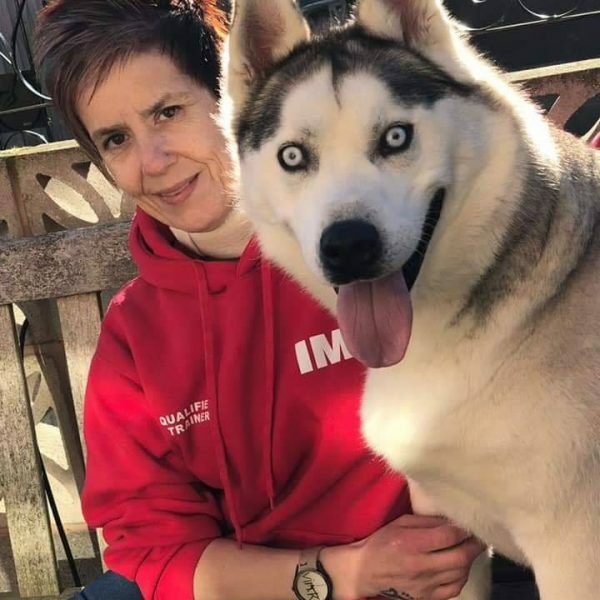 Sharon lives with her Husky called Simba. To see Sharon's Qualifications please click here.